Three North West agencies have teamed up on a campaign for United Utilities that asked people to ‘Think Before You Flush’. Integrated communications agency, One, design and digital agency Parker Design, PR agency Intelligent Conversation were tasked with communicating the array of things that people flush or pour down the toilet that they shouldn't. Each year United Utilities tackles around 25,000 blockages, costing around £10 million. Intelligent Conversation devised a multi-phase PR programme to highlight the issue and encourage behaviour change. 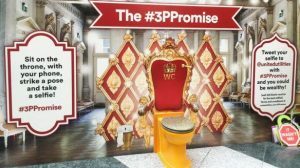 To kick off the 2016 stream of activity, members of the public were quizzed on their ‘toilet confessions’, culminating in a live ‘Big Bog Diary Room’ stunt in Manchester’s Arndale Centre where visitors owned up to their bad bathroom habits before taking the #3PPromise to only ever flush pee, poo and toilet paper in future. Parker Design created an experiential marketing exhibition that stands out from the crowd and presents a serious issue in a colourful and fun wrapper. Everyone that visited the ‘Big Bog’ was awarded a special United Utilities toilet roll, which was designed, sourced, and packaged by the brand team at One. 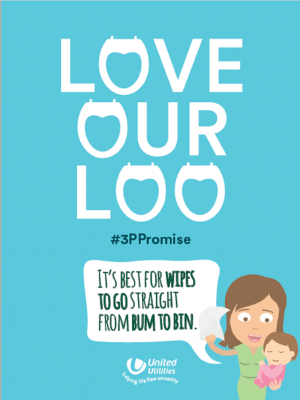 As part of the follow-up parent facing activity phase, One also created a ‘Love Our Loo’ downloadable fact pack to appeal to bloggers and parent/toddler groups identified and engaged by Intelligent Conversation. The pack included information on what causes blockages - with ‘flushable’ baby wipes identified as a big problem area - some facts about what often gets flushed away by kids, a photo competition and some activity sheets for children, in a bid to discourage the public from flushing inappropriate items. On the final ‘Grime Scene Investigation’ strand of work, which saw Intelligent Conversation partner with leading education provider Mad Science to devise an interactive schools workshop to explain the science of blockages and how to avoid them, One created display banners - so-called ‘galleries of grot’ - and eye-catching literature for pupils to take home and share with their parents.